The enduring stereotype of the "big, bad wolf" encountered by Little Red Riding Hood has played a major role in driving many species to the brink of extinction and beyond. Wolves, the largest members of the canine family, once ranged throughout North America, but now are found mainly in remote wilderness areas where they're protected by law. As for badness, most wolves would run the other way at their first whiff of human scent. Widespread disagreement exists among taxonomists -- scientists who classify animals into groups -- about how many species and subspecies of wolves there are. In general, species have significant differences from each other, while subspecies have relatively minor ones. 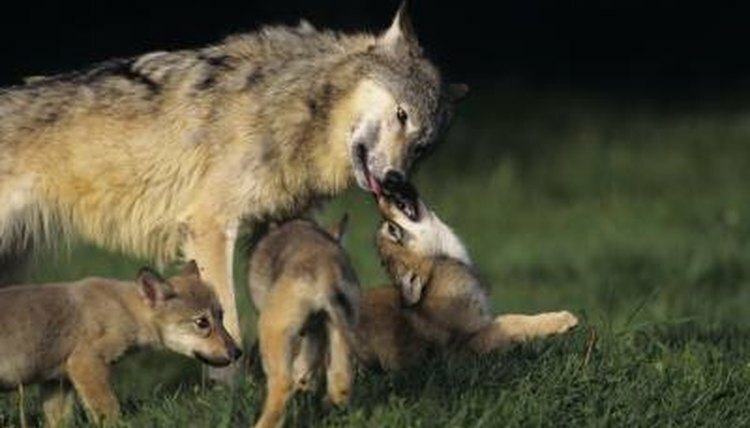 Wildlife biologist Darrin Masters calls scientists who acknowledge many wolf subspecies "splitters," and those who group several subspecies into one classification "lumpers." Masters says that 32 subspecies of one wolf species, "Canis lupus," exist worldwide, 24 in North America and 8 in Eurasia. Other scientists claim that wolves are distinct enough to constitute three separate species, each with its own subspecies. Maybe you think you've never seen a wolf subspecies in its natural habitat, but you have: "Canis lupus familiaris" -- the dog. The largest wolf is the gray wolf, also known as the timber wolf. These animals used to be common throughout North America, but by the mid-1930s, most had been killed off. Gray wolves are still considered endangered, but efforts to save them from extinction by reintroducing captive-bred wolves to wild habitats have been making progress. In 1995, gray wolves were reintroduced to Yellowstone National Park, which is now one of the best places to see and hear them. They can live just about anywhere, including mountains, forests and plains, where they can find enough prey. In the U.S., their range includes Alaska, Idaho, Michigan, Minnesota, Montana, Wisconsin and Wyoming. They're also found in Canada, Russia and a few countries in eastern Europe. The Arctic wolf, commonly considered to be a subspecies of the gray wolf, has been more fortunate than many of its cousins because the sparse population in its natural habitat allows it to avoid conflict with humans. Also known as the polar or white wolf, these animals live in Canada's high Arctic and northern Greenland, where their white fur gives them camouflage against the snowy landscape. In winter, these wolves follow caribou herds searching for plant life to graze upon, so their range is enormous -- up to 1,000 square miles. The Alaskan wolf, also called the Yukon or Mackenzie Valley wolf, is found throughout Alaska and much of western Canada, including the Rocky Mountains. Among taxonomists, whether to classify the eastern wolf as a separate species, a subspecies of the gray wolf, or a subspecies of the red wolf is an ongoing debate. Until this issue is resolved, the U.S. Fish and Wildlife Service has decided to consider it a subspecies of gray wolf. But the controversy over classification became even more muddled after Canadian wildlife biologists, studying what they believed to be eastern wolves in Ontario's Algonquin Park, discovered that many were actually wolf-coyote hybrids, or "coywolves." Another complication: coywolves, mistakenly classified as eastern wolves, have been hiding in plain sight there since the early 20th century. True eastern wolves are found in southern Canada and the northeastern U.S., but coywolves have been making themselves at home in urban centers throughout eastern North America. In 1980, the red wolf, often considered to be a separate wolf species rather than a subspecies of the gray wolf, was declared extinct in the wild. Unfortunately, efforts to reintroduce captive-bred animals to their natural habitats have met with little success. As of late 2013, only about 100 red wolves still remained outside zoos and breeding preserves in the U.S., all of them on protected land in northeastern North Carolina. Live Science: What Is a Coywolf?